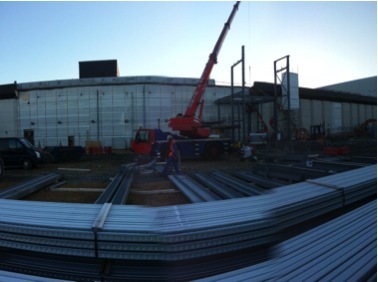 The steel work has begun to be erected on site at Cramlington, Northumberland to create a new extension to the manufacturing facility of Merck Sharp & Dohme. The new extension and remodelling works at their UK production base will allow for the modernisation of the manufacturing process and increase the capacity of the site. Merck Sharp & Dohme (MSD) is one of the largest pharmaceutical companies in the world, who continue to discover, develop and manufacture a wide range of pharmaceuticals to improve human health. The Cramlington facility employs approximately 400 people and has been in operation since 1975. The site is a centre of excellence for tablet manufacturing, packaging and worldwide supply as well as a global centre for stability testing.